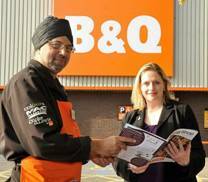 Newly elected Member of Parliament for Brentford and Isleworth, Mary Macleod MP, was keen to visit her local B&Q to learn more about howthe home improvement and garden centre retailer works. Whilst being shown around the store, Mary was interested to hear about the Company’s diversity policy, which means a quarter of B&Q’s workforce is over the age of 50 years, with a similar percentage under the age of 25. She got to meet one of B&Q’s oldest workers, Brian Phelan aged 65, and one of the youngest workers, Steven Page aged 25. She was also particularly interested to hear how B&Q is increasing the skill set of its workforce. Having invested more than £1 million into nationally recognised apprenticeships and City and Guild’s qualifications for its staff nationwide, Mary was given the opportunity to see what this means in Chiswick when she met with Francis Chirayth who has recently received his Retail NVQ. With the environment and ethics at the forefront of many peoples’ minds Mary was fascinated to find out how B&Q say they are helping people make their homes greener and reduce their own business impacts. She was shown some of the products in B&Q’s ‘One Planet Home’ eco range, which the company claim makes it easy for people to identify what they can do with their home to make it more sustainable. Mary says: "I was delighted to be shown all the hard work that B&Q are doing, both in the local community with their employment policies, and with their environmentally-friendly initiatives. With the coming increase in the state pension age, it is important that major employers like B&Q recognise the value that older people can add to their business. We no longer expect to have a 'job for life', and allowing people the opportunity to learn new skills via their employer will give them the chance to broaden their horizons. I was also impressed by B&Q’s focus on green and environmentally-friendly products. "